Bill Ford Jr. now owns about 8.1 million Class B shares, including shares held in trusts for others, including his children. DETROIT (Reuters) -- Bill Ford Jr., executive chairman of Ford Motor Co. and great-grandson of the company's founder, nearly doubled his holdings in a special class of supervoting shares that gives the Ford family more sway over the automaker's direction. The Ford family scion acquired nearly 3.7 million Class B shares on June 19, according to a previously unreported securities filing posted last week. He now owns about 8.1 million Class B shares, including shares held in trusts for others, including his children. 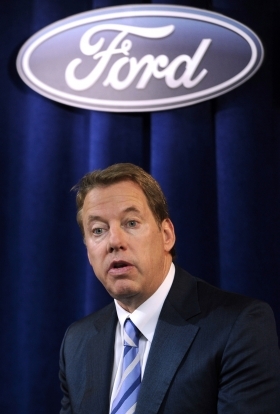 The shares were transferred to Bill Ford from a family member. Ford spokeswoman Susan Krusel on Wednesday declined to provide other details, saying it was a personal transaction within the Ford family. Class B shares make up less than 2 percent of outstanding Ford shares, but hold 40 percent of the voting power. Bill Ford now holds close to 11.5 percent of the nearly 71 million Class B shares held by the descendents of company founder Henry Ford. Bill Ford's expanded stake could be a comfort to investors at a time when the second-largest U.S. automaker is navigating the next delicate steps of its turnaround, some investors say. Ford is currently expanding in China and overhauling its luxury Lincoln brand. The company must also identify and groom a successor to CEO Alan Mulally, who has led Ford since 2006 and plans to stay through at least 2014. Company insiders and analysts widely expect Mark Fields, the automaker's current chief operating officer, to fill Mulally's shoes. "The more control (Bill Ford) has versus the other members of the family is probably more beneficial to the company because he's very, very invested," said Eric Turner, global equity analyst for Turner Investments, which invests in auto stocks and has previously owned shares in Ford. Bill Ford is well respected in the family and recognized for his efforts to steer Ford from the brink of collapse as the automaker's financial crisis deepened, analysts said. In 2006, he fired himself as chief executive and hired then-Boeing Co. executive Mulally. That move helped Ford become the only U.S. automaker to avoid a federal bailout in 2009. The latest transaction gives Bill Ford his largest holding yet of Class B shares, which must remain in the family to retain their supervoting power. The Ford family's voting power diminishes once their Class B shares fall below about 60.8 million. His cousin Lynn Alandt owns 8.3 million Class B shares, while trusts overseen by Ford family lawyer David Hempstead own 9.3 million, according to Ford's most recent proxy filing. The majority of Class B shares are held in a voting trust, which has five trustees, including Bill Ford, his father William Clay Ford, Sr., and his cousin Edsel Ford II, who is also on the automaker's board. "It's almost mythical, the family process," Jefferies analyst Peter Nesvold said. "It's public knowledge that they hold family meetings. They come to collective decisions on things and they vote their shares as a block." The dual class structure was put in place when the automaker went public in 1956. But investors have mounted efforts to change the structure. A shareholder proposal to diminish the Ford family's voting power received the strongest support ever during the automaker's annual meeting in early May. The proposal netted 33.4 percent of votes, up from 29.5 percent last year. "Having the family vote and ownership position really allowed the company to stay focused and not get distracted and survive and ultimately thrive," Bill Ford told reporters after this year's meeting.